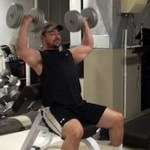 Shoulders are the muscle group that can give you the most bang for your buck in terms of visual results in your body. Because the delts have three heads, a wide variety of movement patterns must be utilized for maximum development. This key shoulder exercise seems simple at first, but there's more to it than just pushing a barbell over your head. These form tips will help you maximize your delt growth and strength gains from this exercise. Learn proper form for this staple shoulder exercise....without these tips, you may find yourself working your triceps and traps more than your shoulders. 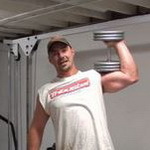 If you have shoulder issues, normal shoulder pressing might not be an option. Using the calf raise machine in this fashion allows you to use a neutral grip and potentially start pressing again. This unique equipment combination will allow you to work the side delts from two directions of resistance at once...vertical and lateral. It will be a new growth experience for your side delts! 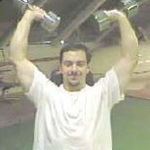 Changing up how you hold the dumbbell is what makes this exercise so good at targeting the lateral delts. 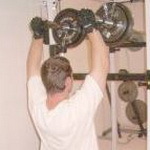 It forces the hands into the optimal position for side delt activation. This is an excellent bodyweight shoulder exercise for beginners. It allows you to use very little resistance while still directly working the delts with a press/push-up. 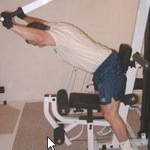 This unique inwards-turned hand position forces the lateral delts to take up the majority of the load on this press. When rear-delt laterals aren't doing the trick, this bodyweight and free weight combination movement forces the rear delts into action in a big way. This exercise gives you the stability of a barbell press with the single-side loading and arced movement pattern of a dumbbell press. This version of the handstand push-up is an excellent strength-builder for working your way up to full handstand push-ups or for simply targeting the delts with a moderate-resistance bodyweight movement. 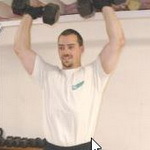 The shoulder is a dynamic joint and the delts function in a wide range of movement patterns. This exercise shifts the load from one side to the other to target a great range of muscle fibers. If you don't have access to a shoulder press machine or if you want to have the stability of a barbell AND the freedom of movement of a dumbbell, this simple machine set up in the power is what you need. You can use more weight at the top of the shoulder press than the bottom...this two-phase exercise targets those ranges much more effectively than straight-through reps. The open hand position of this exercise helps to increase deltoid muscle activation as well as ramping up the stabilization requirements of the exercise. This simple tweak to your form at the bottom of the exercise will help laser-target the rear-delts. To keep tension on the delts all the way through to the top of shoulder press exercise, you need to use a very simple change in dumbbell angle. Every step you take is going to challenge your shoulder strength. 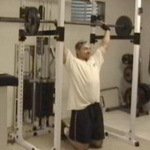 This exercise generates continuous tension and loading on the delts. Don't use the 90 degree bench for shoulder pressing. 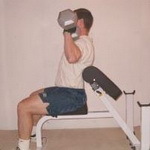 Here's why the Preacher Bench works much better. If you have back problems and can't hold weights overhead because of it, this variation of the shoulder press might be a good option for you. There is almost ZERO back stress with it. Shoulders can be a tough muscle group to fully develop. These new laser-targeted exercises will help you squeeze more results out of every shoulder workout you do.